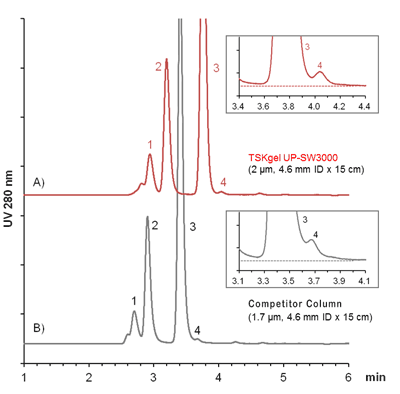 TSKgel UP-SW3000 silica-based GFC columns are packed 2 μm particles, providing high efficiency UHPLC separations of proteins. The 25 nm pore size results in a fractionation range up to 500,000 Da for globular proteins. These UHP-SEC columns are ideally suited for the analysis of antibodies, their fragments, and aggregates in biopharmaceutical R&D or QC analysis. They feature the same pore size as TSKgel SWXL, the current industry’s gold standard for QC analysis of therapeutic antibodies. 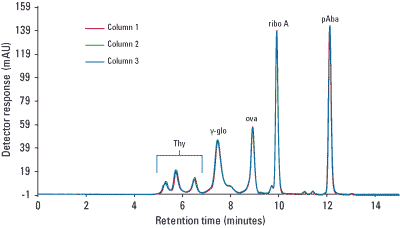 Thus, the new UP-SW UHPLC columns allow a smooth method transfer from HPLC to UHPLC. 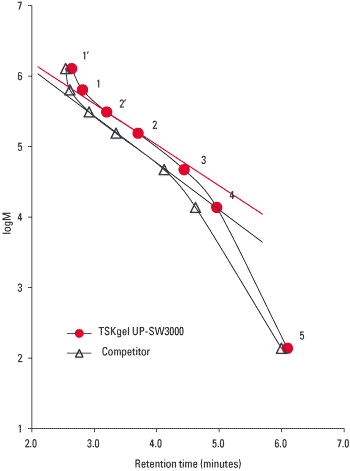 It is important to employ an UHPLC system to take full advantage of the high efficiency that can be obtained on TSKgel UP-SW columns. The columns can also be used with an HPLC system that is optimized with regards to extra-column void volume but maximum plate numbers will not be achieved with HPLC instruments.